1. Preheat oven to 425°. Line a rimmed baking sheet with parchment paper. 3. Crack one of the eggs into a small bowl and fork whisk. This will be the egg wash for the top of the bagels. The other two eggs will go in the dough. 4. In a large microwave safe mixing bowl, combine the mozzarella cheese and cream cheese. Microwave for 1 minute and 30 seconds. Remove from microwave and stir to combine. Return to microwave for 1 additional minute. Mix until well combined. 5. To the mixing bowl, add the remaining 2 eggs and the almond flour mixture. Mix until all ingredients are well incorporated. If the dough gets too stringy and unworkable, simply put it back in the microwave for 30 seconds to soften and continue mixing. 6. Divide the dough into 8 equal portions. Roll each portion into a ball. 7. Gently press your finger into the center of each dough ball to form a ring. Stretch the ring to make a small hole in the center and form it into a bagel shape. 8. Bake on the middle rack for 10 minutes. 9. Remove from the oven and brush the top of each bagel with the egg wash.
10. In a food processor or blender add topping ingredients and pulse for 30 seconds. 11. 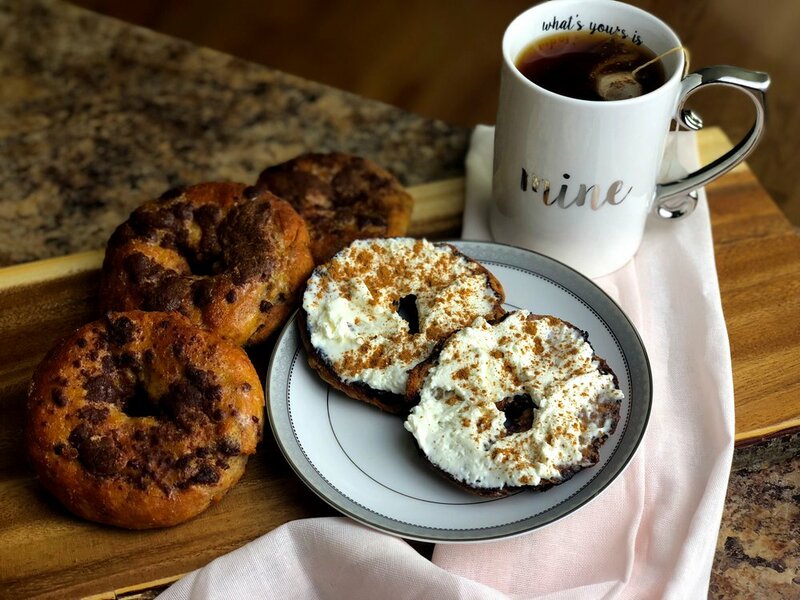 Top each bagel with cinnamon sugar topping. 12. Return to the oven for 2-4 minutes. Remove and let fully cool before slicing!